Driver Fatigue - Just How Dangerous Is It? Most everyone is aware of the dangers of drinking and driving, but did you know that sleep-deprived drivers can be just as dangerous? The AAA Foundation for Traffic Safety recently released a report showing just how dangerous driver fatigue can be. Wave Dreher, a spokeswoman for AAA Colorado says that drivers who haven’t had enough rest behave very similarly to drivers who have had too much to drink. They have the same glassy-eyed look as they stray from their lane and react slowly to other driving stimuli. The AAA report broke down accident risk by the number of hours of sleep drivers got, compared with a full night’s rest. With even as much as 6-7 hours of sleep, a driver’s risk of crashing increases 1.3 times. With 5-6 hours of sleep, the risk of crash increases 1.9 times. With only 4-5 hours of sleep, the risk increases 4.3 times. With less than 4 hours of sleep, the risk jumps exponentially to 11.5 times that of a rested driver. Pointing to the data, Dreher notes that even missing an hour or two of sleep can have a significant impact on a driver’s ability to function safely behind the wheel- you don’t have to pull an all-nighter to be a risk to yourself or others. She also added that the crashes AAA looked at for this study caused injuries that sent vehicle occupants to the emergency room. When asked, most drivers- in fact, 97% of them- admitted to knowing the risks of driving without enough sleep. Some drivers even admitted to feeling the effects of fatigue while behind the wheel. Nearly 1 in 25 drivers who were at least 18-years of age have reported falling asleep while driving within the past 30 days. And although the numbers are thought to be under-reported, it is estimated that drowsy drivers were responsible for 72,000 accidents in 2013. Those accidents claimed 800 lives and caused 44,000 additional injuries. The Centers for Disease Control think that if all the facts were known, as many as 6,000 traffic fatalities every year could be contributed to drowsy drivers. Some drivers are at greater risk than others. 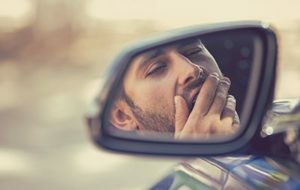 Those who are most likely to drive drowsy are shift workers, commercial drivers, people with untreated sleep disorders, patients taking prescriptions that cause drowsiness, and anyone who doesn’t get enough sleep. Opening a window or cranking up the radio are not effective ways to increase your alertness. Pull over to rest or swap out drivers, if you experience any of the warning signs. If you or someone you love has been injured in a car accident by a sleepy or drowsy driver, you may have a right to file a claim to seek compensation for your injuries, lost wages, and pain and suffering. Your Colorado Springs car accident lawyers can help you obtain the justice you deserve and the compensation you need after an accident. Contact the experienced Colorado Springs car accident attorneys at the Green Law Firm today to schedule a no-obligation consultation and discuss your case. Call us today at 1-719-694-8515.